It looks great and has a fine cast, says Raja Sen, but doesn’t deliver the magic we’ve come to expect from Pixar. What’s that song about lost souls swimming in fish-bowls? Pixar’s new film, a sequel to the luscious and heartwarming 2003 film Finding Nemo, is all about that pacific blue-tang fish who can’t remember much. 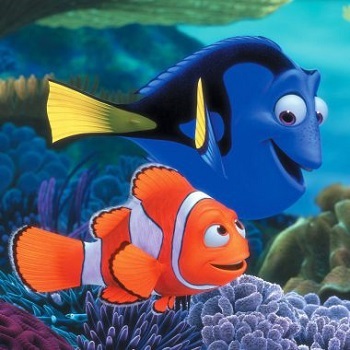 Voiced by Ellen DeGeneres, the loveable character with short term memory loss made the first film shine, and Finding Dory gives us her turn in the aquatic spotlight. Things have changed in the last 14 years. Pixar films, for one thing, have become immensely sophisticated. In terms of 3D rendering and textural work, naturally -- jaw-dropping visuals abound here, involving tentacles and antennae and chortling sea-lions -- but also in terms of subject matter and storytelling ambition, and this is where Finding Dory falls short. This is a film packed with laughs and pathos, but the emotional manipulation is too blatant, too obvious. DeGeneres, for example, is a performer who laces all her lines with a slight but sure irony, as if her character has an eyebrow raised as she speaks (albeit because she may have forgotten to lower it). The result is a flaky yet well-rounded character who wins you over with her own charm. This new film, on the other hand, opens with a flashback of a much younger Dory, her cutesy baby voice -- sounding always on the verge of baby tears -- helplessly and fumblingly speaking about her Memento-like condition. You’re meant to reach for the kerchief right from the start. Your eyes well up in this film mostly because they’re being commanded to, and there is a disappointing lack of subtlety to director Andrew Stanton’s string-pulling this time around. There is, however, an absurdly fine ensemble cast -- Diane Keaton as Dory’s mom, Kaitlin Olson as a nearsighted whale, Sigourney Weaver, in a touch of brilliance, playing Sigourney Weaver, and The Wire alumnus Idris Elba and Dominic West as those sniggering sea-lions, mouthing off in (an intelligible variant of) cockney -- and they’re led by Modern Family’s Ed O’Neill as Hank. So fantastic, indeed, is O’Neill as a reluctantly valiant octopus with a missing arm that existing toy octopi are in danger of having one tentacle torn off. It is the kind of bravura performance that single-throatedly powers through a lazily written film and makes it somewhat memorable. Children will -- and should -- love Finding Dory. It is unabashedly slapstick in the goofiest, most old-school fashion, while containing parables about disability and, rather pointedly, about kids being casually cruel to fish. It is a frequently funny, simple and touching story of friendship and of family, and will get kids interested in various kinds of undersea fauna -- and, naturally, undersea merchandise. It is just that to those of us hungrier for more -- those who remain haunted by the first hour of Wall-E, those who were genuinely devastated by Toy Story 3, or dumbfounded by the remarkable Inside Out -- this tastes like old fish. Fine when fried and served up with chips or popcorn, sure, but not, in any way, magical. This is an immensely Disney film, but oh Pixar, like that song about fishbowls (and about going round and round in unending circles), how I wish, how I wish you were here.